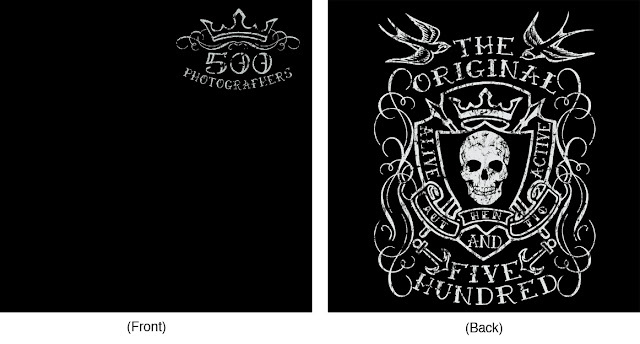 This is your chance to own the second limited edition 500 Photographers T-shirt and support the 500 Photographers project. If you decide to buy one of the hundred T-shirts you’ll be getting a unique, quality silk-screen printed, BLACK Fruit of the Loom Heavy Pocket T-shirt. It contains a small pocket on the left front side with the small front design and a large design on the backside. The securely send package comes with a ‘Certificate of Authenticity’ which includes the exact number of your T-shirt. This is on a ‘first come first serve’ basis. article writing submission . The first buyer will get number 1 of 100 and the last will be getting number 100 of 100. Also included is a variety of 500 Photographers stickers. How can I purchase my T-shirt? Below this message is a PayPal “Buy Now” button. Using your Paypal Account or credit card you can purchase your copy. Make sure to choose the correct destination (Outside Europe, Europe or The Netherlands) and the correct T-shirt size (Small all the way through XXL). Also check whether the address given on your PayPal account is still correct. The T-shirt is 29,95 incl. VAT. Depending on your destination shipping costs are added. If you decide to buy a T-shirt, I’d like to thank you in advance for your support of the 500 Photographers website. This entry was posted in 500, 500photographers, Contemporary Photography, Uncategorized and tagged Amp, Backside, Black Fruit, Certificate Of Authenticity, Contemporary Photography, Correct Destination, design, Destination Shipping, Europe Europe, Exact Number, Fruit Of The Loom, Incl Vat, Kristiaan Passchier, Limited Edition, Number 1, Paypal Account, Photographer, Photographers, Photographs, Photography., Quality Silk, Shipping Costs, Silk Screen, Slinkystyles, Stickers, T Shirt, tattoo, Xxl on July 16, 2012 by Mr. Five Zero Zero.